An international research team led by Takuji Waseda, a professor of the University of Tokyo, Japan, has found an increase in high waves and winds in the ice-free waters of the Arctic Ocean, a potentially dangerous navigational tipping point for the "new and unusual" state of the waters. The research was conducted as part of an Arctic region research project, called the Arctic Challenge for Sustainability (ArCS). The project umbrellas eight themes, each focused on a different aspect of environmental improvement and sustainability in the Arctic. Through the encompassing research themes, the project has mobilized almost all of the polar scientists in Japan. "Forecasting of waves and estimating the chance of sea spray icing on a ship is very important for safe navigation under the new and unusual state of the Arctic Ocean," said co-author Jun Inoue, an associate professor of polar science at the National Institute of Polar Research, a part of the Inter-University Research Institute Corporation Research Organization of Information and Systems (ROIS) in Tokyo, Japan. Inoue led the first theme of the ArCS project, which focused on studying the predictability of weather and sea-ice forecasts. The first theme of the project also looks into how users of the weather forecasts participate in providing related data to further improve such predictability. Their results were published in Scientific Reports in March 2018. Researchers used the ERA-Interim reanalysis, a global atmospheric data collection system, to examine nearly four decades of emerging trends of increasingly extreme waves. 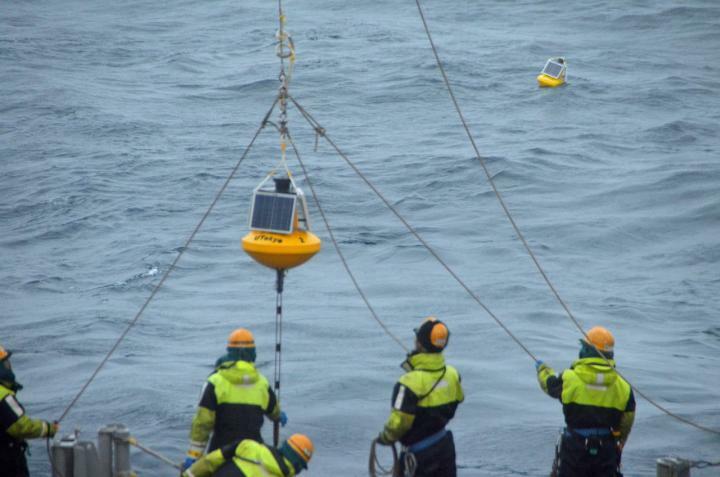 They directly measured waves with buoys in the Arctic Sea in the summer of 2016 to validate the results predicted by the ERA-Interim reanalysis. They saw an increase in both winds and high ocean waves, as expected since a few million square kilometers of the sea's ice covering has melted in the past forty years. The larger the ice-free water area, the greater the probability of encountering a large wave, according to Waseda, which has potentially grave implications for the shippers navigating through the Northern Sea Route, as well as for the coastal populations. "As the entire Arctic Ocean is expected to be ice free by 2050, the wave height is projected to increase correspondingly," Inoue wrote. Ice in the Arctic continues to melt, removing the windbreaks from the ice and allowing waves to grow. "The gradual change in wave heights and frequency over the ice-free Arctic Ocean would influence not only… the business strategy of the [shippers] using the Northern Sea Route, but also on the local life near the coastal region," Inoue said. Coastal erosion would also increase with the height and frequency of waves, according to Waseda. Inoue pointed to the Polar Prediction Project, of which he is a steering committee member, coordinated by the World Meteorological Organization. The project is running the Year of Polar Prediction, an aggregated forum for scientists to better forecast weather and climate conditions in the polar regions. This work was supported by the Arctic Challenge for Sustainability Program of the Japanese Ministry of Education, Culture, Sports, and Technology. The rest of the research team includes Adrean Webb of the University of Tokyo at the time of data collection and currently of the Disaster Prevention Research Institute at Kyoto University in Japan; Kazutoshi Sato of the Arctic Environment Research Center at the National Institute of Polar Research, who is currently at the Kitami Institute of Technology in Japan; Alison Kohout, of the National Institute of Water and Atmospheric Research in New Zealand; Bill Penrose and Scott Penrose, both of the P.A.S. Consultants Pty Ltd. in Australia. The coordination of these institutions, facilitated by ROIS, will contribute to opening new areas of research and performing integrated transdisciplinary research. This framework will allow a holistic approach to the complex issues of life, earth, environmental and social sciences, including the generation of large-scale and heterogeneous data from observations, measurements and experiments, knowledge extraction from these data, the discovery of scientific truths, technological advancements in database construction and implementation. We will also widely share with the community, the outcomes, resources and research platforms necessary for new frontiers of research. Informatics methodologies utilized to elucidate complex systems, research, and development related to advanced usage of databases and networks, in addition to the operation of databases and networks will also enable us to serve as an information platform that will support the rapid and effective development of research both in Japan and abroad.